The Silverthorn model has 2 Beds and 2 Baths. This 1240 square foot Double Wide home is available for delivery in Arizona, California, Nevada, New Mexico, Colorado, Utah. 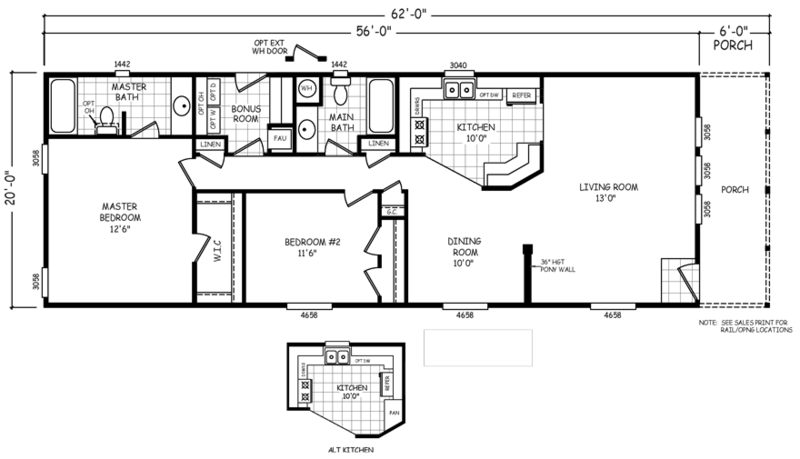 The beautiful Silverthorn offers 1,240 square feet of beautiful manufactured home living. Can you visualize yourself lounging on the full length covered porch, awash in natural sunlight and fresh air? Suitably, the incredibly spacious living room offers a full, unobstructed view of the porch. If pictures are shown, they may depict upgrades and options that are not included within the base price of the home. Ask your housing consultant for details about the other great features that come standard on the Silverthorn manufactured home.